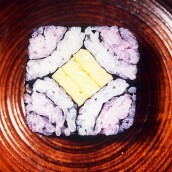 Gomoku sushi that is indispensable for festivals. "Kakimaze (bara sushi)" is also called "gomoku sushi" or "osumoji" and it is a kind of sushi cooked for sekku and festivals. People cooked plenty of it, and made it souvenirs. Sushi cooked with kintokimame (red kidney beans) is very unique, and kintokimame actually goes pretty well with sushi rice. Peanuts are used in the southern part of Tokushima Prefecture. 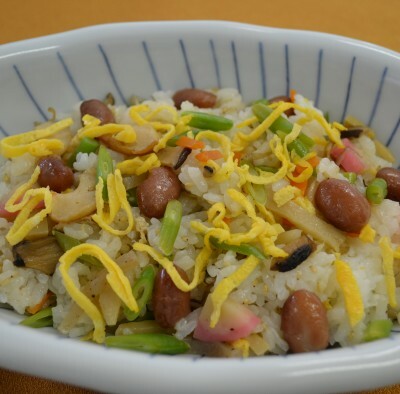 Inoko sushi is a dish served to God along with farm products on the day of the boar in the tenth lunar month by wishing "plenty of harvest to fill in masu next year" and serve to God in masu filled up to eight tenth of it. (Cook kintokimame) Put kintokimame and water in a pan a day ahead. Put the pan over the heat until water comes to boil. Remove water, and cook for about 40 minutes over low heat. Add seasonings once the beans become soft. 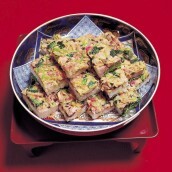 (Cook sushi rice) Wash rice 30 minutes before cooking in summer, 1 hour in winter, and soak in water of 1.3 times of rice. Cook rice once fully soaked. In a meanwhile, mix vinegar, yuzu vinegar, white sugar and salt. Mix the seasonings into cooked rice, and roughly mix them. (Prepare other ingredients) Cut konnyaku into rectangles, rub with salt, and wash. Hydrate koya tofu, cut into 6 pieces in length, and cut into small pieces. 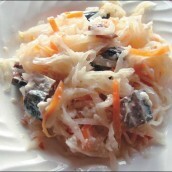 Slice chikuwa into halves in length, cut burdocks into thin slices, and slice carrots into thin rectangles. Cut aburaage into halves in length, and into thin slices. Hydrate shiitake mushrooms in lukewarm water, and slice into strips. Add dashi, white sugar, soy sauce, sake, dashinomoto and niboshi into a pan with all the ingredients in 7, and cook until all the liquid is boiled down. 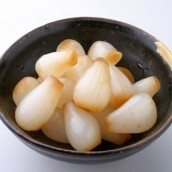 Boil kinusaya, and cut diagonally into thin slices. 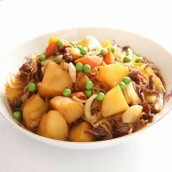 Beat eggs, add starch (dissolved in water), oil a frying-pan, and cook a thin fried egg. 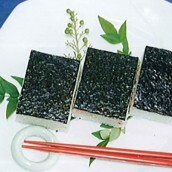 Cut into thin slices to make kinshitamago. (Mix sushi) Add all the ingredients into sushi rice in 9, and mix well. 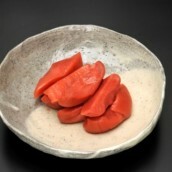 Dish out in a plate, put kinshitamago, kinusaya and kintokimame on top, and serve with amazu shouga on the side.